Bring your wonderful children to Mass and join us on Sundays at 9:30 a.m. All year long we have Toddler Care available. Plus, from September through May, we happily provide Children’s Liturgy of the Word. 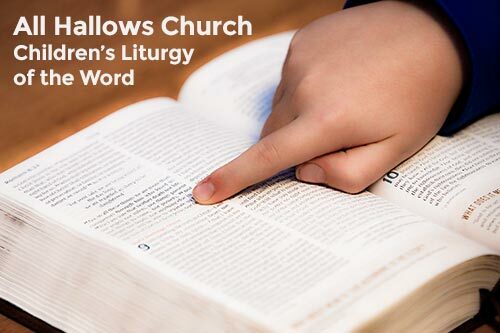 Children’s Liturgy of the Word is a program in which the Sunday scripture readings are proclaimed and explained on a level appropriate to young children. Any child age 4-11 may participate, and no registration is necessary. The children gather with their leaders in the front of the altar after the Opening Prayer and are sent forth by the presider. They process. After a brief Welcome and Opening Prayer, they listen to the First Reading proclaimed from the Children’s Lectionary. They are then led in singing a Psalm and Gospel Acclamation. Next, the Gospel is proclaimed by one of the adult leaders. An age-appropriate reflection on the Word is shared by the leader through stories, discussions, or pictures – whatever the leader finds most appropriate to conveying the meaning of the scriptures. The children are then invited to share their own thoughts and ideas. Following this, the children profess a simple Act of Faith, pray their Prayers of Intercession, and finally return to their families at the time of the Presentation of the Gifts.